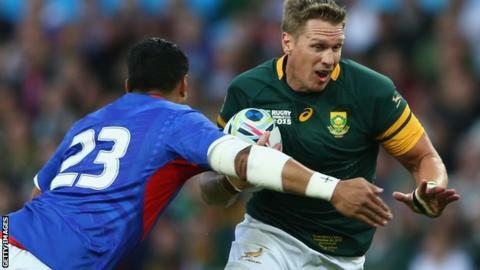 Leicester Tigers have completed the signing of former South Africa captain Jean de Villiers. The Premiership club initially failed to agree a deal with the 34-year-old centre but talks later resumed. De Villiers, who played 109 times for South Africa, was part of their World Cup-winning squad in 2007. He led the Springboks at the 2015 World Cup but announced his international retirement after suffering a fractured jaw against Samoa in the pool stage. De Villiers, who will link up with Leicester at the start of December, is South Africa's most-capped centre and was named their player of the year in 2008 and 2013. Tigers director of rugby Richard Cockerill said: "Jean brings invaluable experience to the squad. "He is among the leading centres in the modern game and has played at the very highest level for a significant period of time. "In recent seasons we've brought in players like Brad Thorn and Lote Tuqiri from successful environments in the southern hemisphere and they have made a significant contribution here. "The signing of Jean is another move in that style and we look forward to welcoming him and his family to the Tigers and to him starting work with us on 1 December."